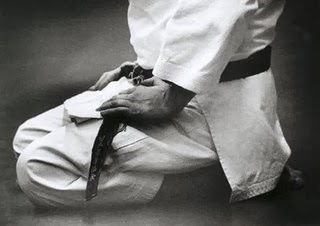 During Karate training, it is fairly common that meditation is practiced. What purpose then, does meditation serve; since the body is remained in a still position? Meditation practiced at different stages of the training serves different purposes. When meditation is done at the beginning of the session, it is to empty one’s mind of any thoughts, fear, distress and getting the mind ready for the hard training that follows. 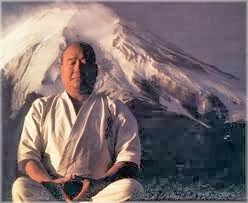 Some instructors may have you to meditate in a standing position or in the seiza (kneeling) position during the training; while your face is flushed and heart is beating at an accelerating rate. The purpose of this is to train you to experience peace, being aware of your surroundings and having no disruptive thoughts running through your mind. 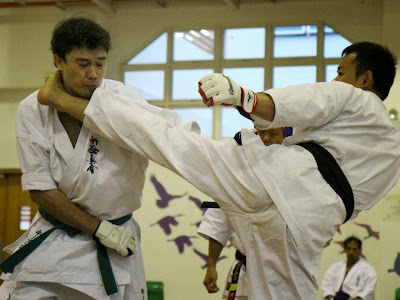 This is important because during kumite (sparring), one may be strong physically but if the mind is full of angst, disruptions or anxiety, the mind would be restricted and hence the bodily movement that reacts to the mind’s instructions would be stiffen and less agile. With a calm and clearer mind, no matter how intimidating the opponent may seem, your body would be able to react naturally and swiftly to defend and attack your opponent. Mokuso also allows deep breathing which your body would have the chance to take in the maximum amount of oxygen possible. When your body breathes slower but better, the slow and steady respiratory rate will stabilize the nervous system. Most new karateka would have experienced slight fidgety when Mokuso is first practiced. This is entirely normal for the mind has not been accustomed to remain calm and in the state of “being” when the body is extremely fatigued. However, one would find that Mokuso brings the mind a sense of tranquil and would look forward to it with regular and frequent practice. Meditation done towards the end of the training reinforce the strong will power that one seeks to attain through the training of Karate. It would also regulate the respiratory pattern of the body. Place 3 fingers below the belly button. This is the region called the seika-tanden. It is where the air should be going down to. During meditation, breathe in through the nose and feel the abdomen taking in the air instead of the chest doing so. Hold the air for about 2-3 seconds in the seika-tanden as you breathe in. Air should be exhaled out through the mouth slowly for about 10 – 15 seconds. The abdominal muscles should be tightened slightly. Be aware that you should retain about 5-10% of air inside you after you breathe out. During Mokuso, just as like the chinese characters of it- 黙想, the only concentration should be on the breathing. It is not the time for you to think about your day at work, or what you are planning to do later during the day after training. You should relax and be in the state of here-and-now, also known as the state of being at the moment. Indeed, it may seem like a basic breathing exercise which does not require much thoughts into it. In Kyokushin Karate, the simplest form of training is actually the hardest to achieve. Training the mind is as important as it is to train the body. Posted on October 29, 2013 by admin. This entry was posted in Article. Bookmark the permalink.